Itâ€™s been a little bit since spending a week in the Toyota Prius. While Iâ€™ve never been crazy about its looks, I think I like the previous iteration better than the 2017 update. But, I suspect, when aiming for the purchase or lease of a Toyota Prius, or any other hybrid, one isnâ€™t necessarily thinking about its style. In talking with other automotive press, itâ€™s no secret many have never favored the Prius. On the up side, though, most are astonished how good a car this is, and that they walk away feeling positive about what it offers; not to mention the over 50 miles-per-gallon fact. Each time I have the pleasure of test-driving the Prius, I 100 percent understand what makes this buyer tick. This is one of the easiest vehicles to maneuver; not only is it agile, it is quiet and comfortable, has a great turning radius and most importantly, one does not climb out of it feeling tired. The last time I test drove a Prius, I packed it up and drove to Vermont. Unbelievable how many things I toted in this vehicle. As much, or more than any SUV (note: even more cargo than what I packed into a $84,000 2017 Toyota Land Cruiser). The pros one notices when driving the Prius Two Eco include the improved ride for 2017, its efficiency, lots of storage (in spite of a battery), and comfort. As with all vehicles on the market, one can find cons, and the Prius has a few, including the exterior design (need we say it again), an underwhelming interior trim, and while obvious, itâ€™s no racer. The cabin is quiet, even when running on gasoline, and the amount of high-tech safety equipment is impressive. One has to admit though, that each year, the Prius vehicle gets better. The â€˜gold standardâ€™ of hybrids, the Prius has been unmistakable since its inception in 2004. Always with a focus on efficiency first and foremost, the Prius didnâ€™t have much competition in its early years (Honda Insight). That isnâ€™t the case now-a-days-all manufacturers want to get in on the market, which includes Lexus CT, Ford C-Max, the new Hyundai Ioniq, Chevy Cruze Diesel and Kia Niro, to name a few. Not much has changed, looks-wise for 2017, as the Prius was overhauled in 2016. Those changes included switching the nickel-metal-hydride battery pack for lighter, industry-standard lithium-ion cells in most models, a multilink rear suspension (to improve the ride), and, of course, the questionable exterior redesign. Entune Premium audio system with navigation and access to the app suite is the sound system, along with 4.2-inch color dual Multi-info display. While small, itâ€™s adequate. Also standard is the Qi-compatible wireless smartphone charging capability. The steering wheel is draped in soft-touch synthetic leather, with audio control buttons. A CD-player, auxiliary jack, Bluetooth compatibility and USB Port are standard. On those models at trim level Three and above, Entuneâ€™s premium version is standard, adding navigation, Toyotaâ€™s App Suite, and a Qi compatible wireless charging pad. Perhaps what needs to happen next to Prius is a more inviting, upscale interior, and a few exterior tweaks. We did like the Priusâ€™ fabric-trimmed seats. We found it fun and different, yet worried that such a light color would no doubt show all the dirt. Our driverâ€™s seat was 8-way adjustable, with 4-way adjustable passenger seat. The split rear fold-down seats are practical and allowed for stashing tons of cargo, to the ceiling. The Prius Prime, introduced this year, is an all-new model in the lineup. This plug-in version has an all-new drivetrain, longer EV range and quicker recharge time, along with better looks, fuel economy and more high-tech interior. 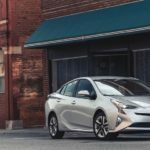 There are seven trim levels in the Prius lineup, some of which include the Two ($24,685), Two Eco (our test vehicle, starting at $26,030), the Prius Three ($27,735), Three Touring ($28,115), Four ($29,135), and Four Touring $30,015. It was especially entertaining watching all that comes up on the display. At one time, while driving with my foot on the brake (and accelerator! ), I was reminded by the dash monitor. Amusing. Even little vehicles have a sense of humor. EPA fuel Economy: 58/53 mpg.